Hubby and I take frequent weekend road trips to see family. This is great since we get to spend lots of quality time with them, but it can make planning a little more challenging for me. I’ve come up with a couple things that have helped make planning while traveling easier for me, so I thought I’d share in case anyone else finds this info helpful, too. I use the Erin Condren Life Planner, which comes with month and week views. When I’m traveling, I’m usually focused on the week view only of the upcoming week. One of the best things I can do in the days leading up to my trip is choose a color scheme. This reduces the amount of supplies I need to take with me, especially the more selective I can be. 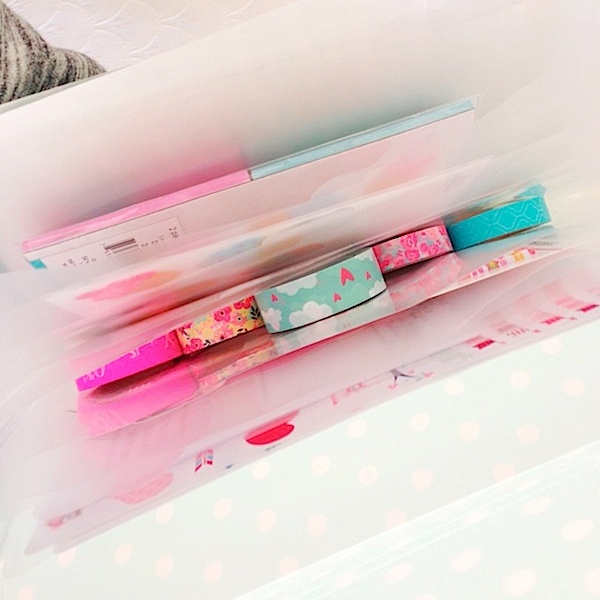 If I know I want to go with a pink and turquoise theme, then I don’t need to bring any of the supplies in other colors. I actually decided to bring all my Valentine’s Day supplies with me this past weekend, and I have a lot of those. A lot. Seriously, I’ve been raiding the Target Dollar Spot like whoa. So, I’ll do another post with tips on if you want to bring a bigger stash. To keep things simple, the easiest thing is to have a good idea of what you want to do and bring only what you need to make it happen. I picked up a cute turquoise polka dot accordion file from the Target Dollar Spot recently. Actually, let’s be real. I picked up a few of these. But, I find the short and long shape (there are three options that I’ve seen so far) works best for planning while traveling. It’s long enough to hold some of my taller sticker sheets. It can also fit my sticky notes and washi tape. Probably the best thing about it is that it keeps my stickers nice and flat so they don’t get out of shape or accidentally peeled off. I also like having most of my supplies in one easy-to-access place and the ability to keep my stickers separated. You could do them by color or theme, but I’m currently keeping my Etsy stickers grouped by shop. You can even put your scissors in here. It holds so much, and it was only $1. I’ve been using planners longer than I can remember. It was always one of my favorite school supplies when I was a kid. I think I started using them as early as middle school. Since then, I’ve tried carrying it in various ways. I’ve tried jamming it into other bags containing many things. I put it in the same bag as a reusable water bottle one time, which was a big mistake. What kind of water bottle leaks!? The best thing to do is to have a dedicated tote to protect your planner from liquids, foods, pointy objects etc. 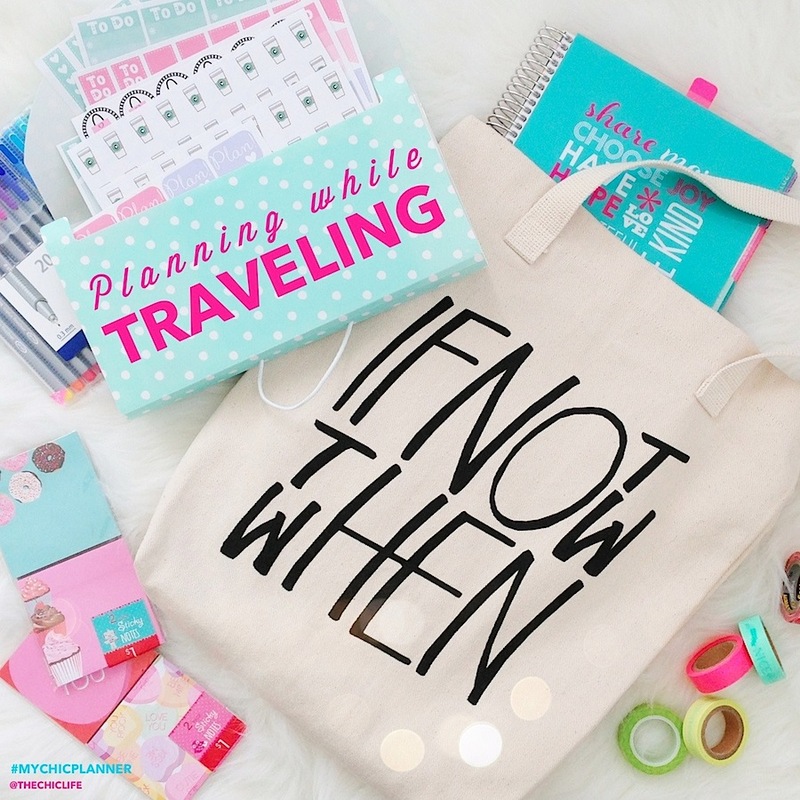 Keeping your planner in a separate bag will also help since you can treat that bag extra gently. You won’t put it at the bottom of your luggage or shove it into some crevice of space in the car. You can really take care of your precious…I mean…planner. It’s amazing how different stores, even of the same big chain, can have a different stock of planner supplies. When I’m traveling, I like to go on mini shopping adventures. I love to check out the stores to see what goodies I may find. Inevitably, I find a new sheet of stickers of a style of washi tape I’ve never seen, so I like to use my trips to collect new supplies. I like collecting a couple different things (mugs, journals, etc. ), and craft supplies is definitely high on my list of things to shop for when I’m out of town. Hope you enjoyed my Planning While Traveling post! If you have any planner-related post requests, let me know in a comment below or shoot me an email at thechiclife at gmail dot com. I’ve toyed around with the idea of making a video because I think some things are just easier to show in video format, but videos terrify me! I keep hoping to muster up the courage over the years, but I may just need to stick with photo-blogging. We’ll see!